Crab shells after a peeler run. Photo Credit: Emmy Nicklin/CBF Staff. The honeybees are happy here in the Merrill Center's woods because the locust trees are in full bloom. The water temperature out front in the Chesapeake is 610 (F.). Down the Bay at the mouth of the York River, it’s higher: 650 (F.). The moon will be full on Wednesday. Light tackle fishing guide Capt. Chris Newsome on the Piankatank is busy taking clients out to his river's underwater grass beds. Tangier's Mayor, James "Ooker" Eskridge, isn't getting much sleep, but not because of island politics. And Paul's Homewood Café in Annapolis has a special springtime treat on its menu that's connected to Ooker's lack of sleep. All those occurrences are related. 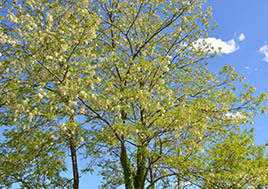 Locust trees in bloom in early spring. Welcome to the "Peeler Run," when the Chesapeake's crabs slough (shed) for the first time each year, as water temperatures reach that magic low-to-mid-60s mark. The locust blooms and their sweet aroma announce that beach-combing will turn up pale, limp crab shells that are hinged in the front and empty when examined. Somehow, the combination of air, water, moon phase, and soil temperatures produce these natural cues to the Chesapeake's spring season. As Ooker's peeler pots fill with "rank" (about-to-shed) crabs, both he and his wife, Irene, stay busy tending them 24/7 in the "floats" (shedding tanks) around their shanty. Ditto for other soft crabbers, from Capt. Bob Jobes in Havre de Grace at the head of the Bay to Roy Ford on Deal Island. Many of the soft crabs their operations produce end up on the New York market, but plenty also turn up at local establishments like Paul's Homewood Café. Sloughing is a stressful process for blue crabs, which must survive the process some 21 to 23 times during their lives. The strenuous activity drives up their need for oxygen about six times. In this first peeler run's cooler temperatures, there is plenty of dissolved oxygen in the water. As summertime temperatures climb into the mid-'80s, though, sloughing mortality can go as high as 40 percent in waterways where nitrogen pollution drives algal blooms that cause lethal crashes in oxygen levels. 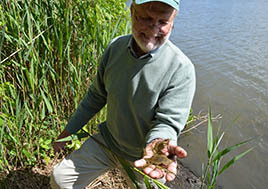 CBF's Senior Naturalist John Page Williams holds the shells of recently shed crabs in early May. Two more problems for sloughing crabs are habitat loss and predation. Historically throughout the Chesapeake, the best protection for sloughing crabs has been vast meadows of underwater grasses, especially in Tangier Sound. 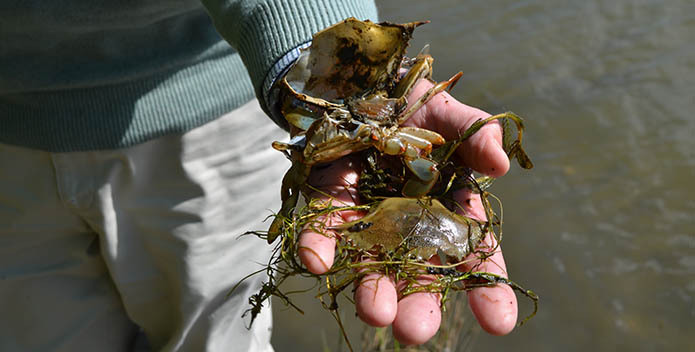 In the past 40 years, pollution has caused a brutal decline in those vital shallow water habitats, but the latest 2015 and 2016 reports from the annual Baywide grasses survey of the Virginia Institute of Marine Science have shown encouraging increases. CBF's 2016 State of the Bay Report graded underwater grass beds at 24 out of 100, still a D- but the highest rating we've recorded to date. The positive trend tells us that the Chesapeake Clean Water Blueprint is working. As to predation, "A soft crab doesn't have a friend in the world," laughs Chris Newsome. "We're not the only ones who want to eat him." In fact, predator fish like rock and speckled trout actually key on the first peeler run to move into shallow waters to feed. The run cues him and other light tackle guides like Capt. Kevin Josenhans and Capt. Walt in Tangier Sound and Capt. Ed Lawrence in Mobjack Bay to move into those rich areas, to delight their clients with beautiful catches (which they often release with care). Between soft crab sandwiches and memorable days on the water, there is much to celebrate in the first peeler run. If we want to keep these runs strong, though, we're going to have to manage our harvests carefully and continue the struggle to restore their underwater grass habitats and the dissolved oxygen they need to keep growing. 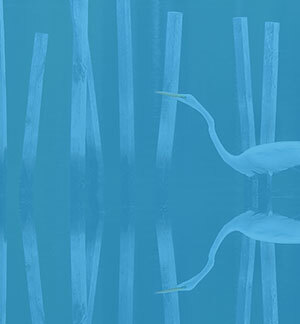 As always, following the Chesapeake Clean Water Blueprint is the key to a healthy Chesapeake.